Tell me about your oven mitts... Anyone use one of these ? Or something like it ? I think Shortcake would flip if I got this puppy one . I need some new oven mitts. I'm tired of the old fashioned fabric ones I've been buying wearing out on me. Something will spill on it, then it has to be washed, then the protective padding gets thin so that I find myself rushing to set the hot pan down before my fingers get too hot to hold it. So... tell me what you use and why you love it. Thanks! This is a great question. I so often see these new and modern ones in the kitchen stores and I hesitate not knowing how good they are. I never hear anyone talking about this. P.S. What did you ever decide on with the microwave? We ended up getting a small countertop microwave. I am afraid that the heated sinus packs and neck warmers that both Husband and I use regularly during allergy season just couldn't be heated well any other way. I have an oven mitt, but I usually just use a towel- mostly it works. :) Sometimes, not so much. I have been through so many mitts. Since we have a gas stove, most of mine were burnt at one time or another (scary, but true). I now have a couple of these new silicone ones that my kids gave me last Christmas. Nine months later they still look great, and I haven't burnt myself once! They do feel much more bulky than your traditional type, so that may take some getting used to. Overall, though, I like them. Hope that helps! I have some silicone pads, and though I like them for setting food on, they are hard to bend around casserole dishes and pots. How about crocheting some or knitting them? I love the cotton hot pads I have knitted. Just a double thickness of cotton yarn (two equal size squares stitched around the edges). I bet you can easily find a pattern for a mitt. I use quilted mitts, the oter fabric is a heavy duty upholstery cotton, with a thick padding and the silver stuff in the lining, I've bought them all at a locally grocery market, I love them, I've washed them many times and have had no trouble with these. The brand the tag says is NowDesigns. It's all I use now. I'm not much of a silicone fan. 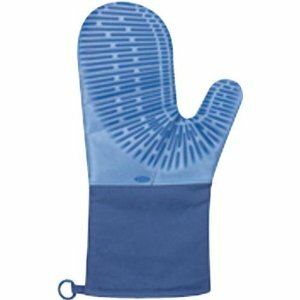 I use these oven mitts from Williams Sonoma. They are the only cotton ones that I find thick enough. They are scorched, and pretty dirty too. I only spot wash them, so they will last longer. I've considered silicon, but am not sure about flexibility. I wasn't very impressed by the one silicon mitt we got. I didn't like the lack of flexibility and didn't feel like it was really insulating enough. I never burned myself but I almost dropped a pan once because it still felt hot. But it wasn't one of the ones you linked to. Maybe mine was just a bad off-brand. The mitts I like best are the uber geeky Alton Brown red fuzzy ones my husband (the ultimate Alton fan-boy) insisted on buying. They are the only mitts I ever feel completely safe reaching into an oven with. They cover my wrists and forearms so I can't get any of those nasty burns where you graze the back of your arm on the top of the oven. But I don't know where he got them. I'll have to ask and get back to you. The best! It has not fallen apart despite the many yrs using it and washing it. Funny I was thinking of replacing my own oven mitts. I think I might knit & felt some and see how that goes. Most of the time I just use a towel, but mitts are good to have. I need new oven mitts too. One of mine has a really thin spot and I burn my finger far too often. I have a pair of silcone potholders. They also work as trivets, and as jar openers! And they're easy to clean and take up next to no room.